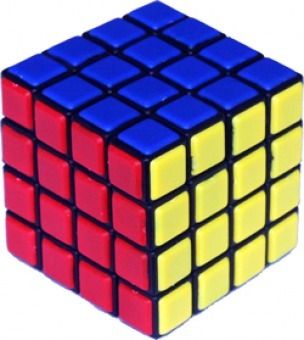 The original Master cube, also known as “Rubik’s Wahn” is a cube which is built from smaller cubes, 4 to an edge, i.e. a 4x4x4 cube. Each slice can rotate, which rearranges the small cubes on the surface of the puzzle. The six sides of the cube are coloured, so every corner piece shows three colours, every edge piece shows 2 colours, and every face centre only one. The new re-worked Master cube has an improved strengthened mechanism and hollowed out pieces which allows us to keep the original price. Unlike the normal 3x3x3 Rubik’s cube, turning a face does move the face centres. The centres therefore can not be immediately used as a fixed reference point. The 4×4×4 mechanism was patented by Peter Sebesteny on 20 December 1983, US 4,421,311. There are 8 corner pieces with 3 orientations each, 24 edge pieces with 2 orientations each, 24 centre pieces, giving a maximum of 8!•24!•24!•38•224 positions. This leaves 7!•24!•24!•36/4!6= 7,401,196,841,564,901,869,874,093,974,498,574,336,000,000,000 or 7.4•1045 positions. Denny’s Puzzle Pages A very nice graphical solution, top/bottom corners and centres then edges, followed by middle edges and centres. Dennis Palaganas’ page also has a solution. Philip Marshall’s page. A solution that does centres, pairs up edges and then solves as for the 3x3x3 cube. Oxford computing lab has an old text based solution here and here. Like the normal cube, there are several types of solution. I will give three examples here, and mention some advantages or disadvantages of each. Solution 1: Layer by layer. Solution 3: Pairing up edges. Let the faces be denoted by the letters L, R, F, B, U and D (Left, Right Front, Back, Up and Down). Clockwise quarter turns of a face layer are denoted by the appropriate letter, anti-clockwise quarter turns by the letter with an apostrophe (i.e. L’, R’, F’, B’, U’ or D’). Half turns are denoted by the letter followed by a 2 (i.e. L2, R2, F2, B2, U2 or D2). The above is the same notation as for the 3x3x3 cube. There is however a new type of move. The internal slices will be denoted by the lowercase letters l, r, f, b, u and d, and the type of move is shown in the same way as normal face moves. Note that these letters mean the slice only, so such a move will not disturb the corners of the cube.